MODX allows some cool side chaining options for both internal Parts and audio coming in via the external A/D input (because the source PART could be an external input from a microphone, guitar, audio device, etc.). This can take several forms and in this session, we'll take a brief look at three of the basic possibilities - including one popular in Electronic Dance Music. Insert Effects are those that are unique to the instrument sound occupying the PART. Twelve of the MODX synth PARTs plus the A/D input PART has its own pair of Insert Effects - which are customizable on a per PERFORMANCE basis. These can be configured in series or in parallel and can be routed from within the synth engine. Significantly, the Insert Effect is not shared by any other PART, and is routed "inline" with the particular instrument sound, allowing you to control this Effect on a per PART basis with assigned physical controllers. Please note: The Side Chain Modulation is immediately active upon selecting a Side Chain Part for the respective Insert Effect, even if the Side Chain Input Level is set to zero. The zero level is an offset value, which can be increased or decreased for controlling the depth of the Side Chain Modulation. Translation: To avoid unintended Side Chain Modulation, basically, the Side Chain Part selections for Insert Effects should be left in the default condition; that is, set to OFF. A Part selection should be made only for activating the Side Chain Modulation. To understand this, the SIDE CHAIN connection option allows audio signal from the source PART to enter and influence (modify) the output of the current PART via its assigned INSERT EFFECT. So just by making the connection, audio is routed in; what we can do is increase or decrease that audio. If you do not want audio signal to route via the side chain, simply leave the parameter set to OFF. The PART with the INSERT EFFECT Side Chain Input will be modified by the PART you route in via this 'side' input. This example shows a very typical Side Chain Compression result, where a "pumping sound" is created for a synth pad caused by the input of a bass drum groove. The Pad sound is interrupted by the input of the bass drum. To be clear: Part 1 contains the PAD sound and Part 2 contains the arpeggiated Kick Drum. The Kick drum causes the Pad to "duck" in volume. 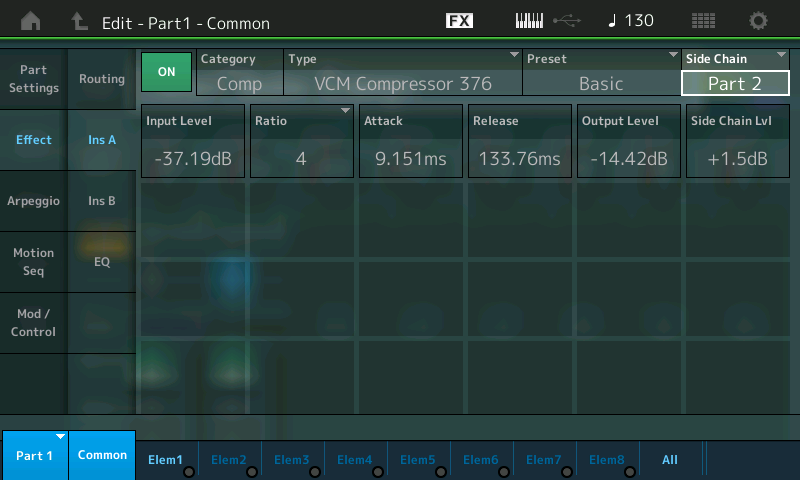 The Compressor is applied to the PAD in PART 1, and instead of using the Compressor to respond to the attack and release of the Pad itself, we are using Part 2's audio to 'duck' the Pad (Side Chain). Only two settings are needed for programming the Side Chain Compression of PART 1. First, the Side Chain ‘Part’ number must be selected Insert Effect "A" in the Part Effect window. It is "Part 2", in this example, it includes the bass drum groove. The Side Chain Input and its Level parameter are found in the MODX by navigating to the PART's Insertion Effect. “Part 1 - COMMON" appears in blue in the lower left of the screen. Touch "EFFECT" in the left column of the screen. Touch "INS A" in the second column. “Side Chain” Input source selection and the Side Chain Lvl are found on the right side of the screen. In the view of the overall Effect ROUTING, you can see where the SIDE CHAIN function is attached to the INSERTION EFFECT "A" box. In this "Routing" screen you can see that each Element can be routed through one or the other (or neither) of the two Insert blocks (A or B). Currently, only Element 1 is active, and it is routed to the VCM COMPRESSOR 376. Notice that it passes through a 3-Band EQ pre the Insert Effects block, and there is a 2-Band EQ post the Insert Effects blocks. You can also see the "INS CONNCT" option in the center can configure the Inserts in series (A>B, B>A) or in parallel. The "Side Chain" option appears above the Effect block where you select the Insert Effect TYPE (Insert A). You can reassign it easily here - convenient redundancy - so you can quickly and easily try out different modulation sources. If you select one of the eight Insert Effect TYPES that support the Side Chain Modulation function, the Side Chain option box will appear. Notice the INSERT "B" (not used in this particular PART) has an empty space where the Side Chain function would appear, but nothing is there because one of the 8 TYPEs is not selected. (The option only appears when the context is proper). Background Details: The SIDE CHAIN is a routing situation that allows audio signal from the SOURCE PART, in this case "Part 2", (an arpeggiated Kick Drum) to create a modifying signal. In this case, the amplitude 'shape' of the audio of the Kick Drum, will cause the compressor to engage. Compressors are amplifiers where the more signal input in the less you get out. It, literally, compresses the dynamic range. The Compressor reduces GAIN of the signal it is applied to, however, in SIDE CHAINING, we flip the script, instead of compressing the Pad, we are going to create an envelope from that incoming signal, the Kick drum, and use it to 'turn down' or "duck" the Pad sound in PART 1. As the incoming signal rises in amplitude (as it attacks) it will cause the PART 1 sound to decrease (duck down) and as the Kick's audio signal (energy) disappears, the PART 1 sound will return. For a rhythmic pulsing/pumping sound. "Ducking" is used on the radio - where the DJ's Voice (source) causes the music program to duck down, and it automatically returns to full volume after the DJ finishes speaking. You can control the ATTACK (how quickly it engages) and RELEASE (how quickly/slowly it ‘lets go’) of this signal creating the ducking action. The Attack Time and Release Time settings are critical to shape the results. When used for speech or singing, the Release is obviously less abrupt than it would be on a percussive signal like a Kick drum or Snare drum. Basically, set them by ear! And while this particular effect is extremely popular in Electronic Dance Music, exactly how you choose to use it will be a matter of experimentation and preference. Side Chain Compression is one of the most popular uses for Side Chaining. In MODX, however, the options for this function are expanded - and the possibilities are many. The Side Chain Input Level must be adjusted for Insert Effect "A". Each SOURCE is likely to need specific adjustment, depending on exactly what you are using to create the reaction. A pre-recorded source is likely to be consistent and therefore easier to deal with, but virtually anything can be used as a source. Experiment. The depth (application) of the Side Chain Modulation can be controlled with the Super Knob, which is assigned to the Side Chain Input Level (InsA SChnLvl). In this manner you can use the Pad normally and then morph to a situation where the Pad and Kick are interacting at the extreme. From HOME (touch the HOME icon upper left corner). Press [SHIFT] + [PERFORMANCE (HOME)] to jump to the OVERVIEW screen. With the PART = COMMON touch "Edit COMMON Control Settings". The start position of the Super Knob is center (64). Moving to right increases the depth, moving to left reduces the side chain compression. Moving to leftmost position cancels the modulation completely. EXTRA CREDIT: Call up factory Preset PERFORMANCE: "Mr. Side Chain"; Play and hold a nice big full chord (hold with the sustain pedal), recall SCENE #3; Slowly rotate the Super Knob from 0 towards 127. You will hear the KICK appear as you reach the 12 o'clock position, and as you increase from there, you will hear the Side Chain Compression Kick "ducks" the Pad sound. Explore further. The MW will control the volume of PAD sound in reverse. In this PERFORMANCE - the KICK drum in PART 7 is used as the Side Chain input to influence the big synth PAD in PART 1. At the same time PART 1's Output is used as a Side Chain compressor input to influence the Arpeggiated PARTs 2 and 3. Play with this multi-dimensional interaction. This example is a variation of the previous Performance = Side Chain Comp. But this time instead of the arpeggiated bass drum groove in Part 2, a synth arpeggio part is used for the Side Chain Compression. The audio pulses caused by the arpeggio phrase now become the modifier - you can use the ARPEGGIO Play FX to create Swing, change the Gate (duration), or offset the Velocity, even change how the phrase references the clock (tempo). Part 1 uses a soft string pad Waveform, which works complementary in combination with the synth arp of Part 2. In this Performance example, the synth arpeggio plays a dual role, musically complementary to the chords played and rhythmically interacting with the Pad sound underneath. In the screenshot below, we see PART 2 - Common > "Effect" > "Routing" but the cursor is showing the PART OUTPUT... experiment by turning the PART OUTPUT from "MAIN L&R" to "OFF". You will still now hear the influence of the Arpeggiated PART 2, but you will not hear the sound of the PART directly. We point this out because, it can be a very useful tool, and greatly expands how you "look" at arpeggios. You can use the rhythmic shape they create without using the musical note pattern that we typically always hear/expect from arpeggios. Remember, most anything can be a modifier in the Motion Control Synthesis Engine. This example is another variation, using the same modulation source (part 2 with synth arp), but a different Insert Effect in Part 1. Different from the complementary functionality of the previous example this time Part 1 supports the arpeggio groove, which is used as modulation source. EXTRA CREDIT PART 2: We will mention the VOCODER here simply because it is another INSERT EFFECT that allows for Modulation. While technically speaking, not a SIDE CHAIN in the same manner as the ones described above, one Part's signal is fed into another via the target's INSERTION EFFECT. Try the PERFORMANCE: "Chilled Vocoder" found in the PAD/CHOIR Category. Turn the Super Knob to the right from center to add more "vocoded" effect. The direct out of the Drum Groove is assigned to OFF, so that you only hear the drums encoded onto Pad sound in PART 1. Use the PART MUTE buttons to isolate just PARTS 5 and 6. The direct out of the Rainmaker sound effect is assigned to OFF, so you only hear its output encoded onto the string (PWM Strings) in PART 5. (Again) The "source" could be a "live" drummer, a "live" guitar player, a vocalist, a mix tape, your favorite playback device - another synthesizer - sky's the limit. Catch up on the previous article in the series - "Mastering MODX 9: Controller Box Switches" here. Next article now available: "Mastering MODX 11: Envelope Follower" here.